Thank you very much to everyone who took the time to nominate a student, employer or tutor for our National Apprenticeship Week awards. We received some inspirational nominations, many of whom went above and beyond the call of duty to make a real difference in their work and beyond! Congratulations to Mandy for winning CAW Apprentice Tutor of the Year. Mandy was nominated by student, Christine Wright, for her ongoing encouragement, motivation and belief in all of her students. This is what Christine had to say about Mandy: I am progressing very well with college work and, due to the efforts of my tutor Mandy, can easily apply the knowledge to my clinical work in veterinary practice. When Mandy teaches theory she always relates it to practice, either by asking students for examples from our own clinical experience or by relating stories from her own. This has helped the members of the class to share experience and gel as a group. This has been significant for me as I am 40 years older than most of my classmates and anticipated having difficulty forming relationships at college, which has not been the case. Mandy encourages and motivates not just me, but all the students she teaches. Deadlines she sets are met, not because we are frightened of the consequences, but because we do not want to let her, or ourselves, down. She often refers to the stage when we will be qualified, never doubting that we will attain this. She motivates me by example, showing her enthusiasm and dedication to veterinary nursing and sharing her knowledge, skills and experience with me. She has always been encouraging and optimistic, delivering her lectures with a balance of knowledge and humour, maintaining professionalism throughout. Mandy always makes herself available for students. I believe that she cares about each of the students, offering support where needed and sharing in the pleasure of individuals’ achievements. Even on days that we have a different lecturer, she will pop in for five minutes to have a chat with us. She has given up her lunchtime to explain a part of the course that I was struggling to understand. She has not just done this for me, she will go out of her way to give extra help to any student that asks. Mandy approaches all students with congruence, empathy and positive regard and always listens to what we have to say. If I have not understood the information provided, she will find alternative sources to suit my learning style. To help me she has printed off an article on dressings, found an animation of myosis and mytosis online, and suggested a programme to watch that dissected a horse to help me understand the comparative anatomy; all of which were very helpful. She helps other students in similar ways. The students are always disappointed when we find out that Mandy is not going to be lecturing us on certain days, and look forward to the days that she is. Congratulations to Emma for being awarded ‘Very Highly Commended‘ in a tough category of nominations, this is what Lin had to say about Emma: Emma has been my tutor throughout level 2, 3 and 4 AAT Accounting and now AAT level 4 Business Skills. This has covered a period of almost five years; both at the CAW Business School and, prior to this, with Mymar Training. She has been continuously positive and encouraging, even when I have taken extra time to complete units. No amount of support has ever been too much for her. Emma’s lessons were always innovative, using a variety of resources and activities. Her tutor groups always responded well during lessons and creating a positive atmosphere which enabled good communication and sharing of ideas. Other students were also always positive in their response and attitude towards Emma. Recently I have been struggling with the Business Skills course, due to ill health. Emma has continued to encourage me, giving me feedback when I needed it and finding time to discuss any difficulties I have encountered. I cannot recommend Emma enough for this award. Her contribution to my professional development has been above and beyond my expectations. Congratulations to Jill Elsworthy for winning CAW Apprentice Employer of the Year. Jill was nominated by colleague Oliver Inwards, for her ongoing support and encouragement. This is what Oliver had to say about Jill: Jill supports me as my line manager, but is a great ambassador for apprenticeships in general, working as a national lead for HEE. Jill has worked in apprenticeships throughout her life, from being in a trust to HEE and is extremely supportive of me, allowing me to flourish as my line manager. She will always make sure I have support, but never restricts what I can do just because of my role (for example, she allows me to present at conferences/meetings if I so desire to help improve my skills and CV). If I ever need something specific from her, she will always go the extra mile to come and see me despite this often extending her working days. In terms of my college work, again she is happy to give me freedom to do it myself, but if ever I am struggling to evidence something for my units, she will make sure I get an opportunity to do so, by rejigging workload or putting me forward for something. 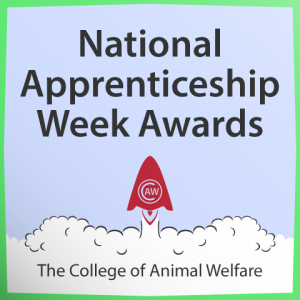 Congratulations to Erin for winning CAW Veterinary Apprentice of the Year. Erin was nominated by colleague Hollie Myers, for her ongoing commitment to her training. This is what Erin’s Tutor, Ginny, had to say about her: Erin started the Level 3 Diploma in Veterinary Nursing course in September and is working hard towards achieving her qualification and becoming a Registered Veterinary Nurse. Although she had some previous practice experience, she is aware that there is always something new to learn and contributes enthusiastically to the discussion in the classroom. She has been successful in her first nursing exam and is now enjoying getting to grips with anatomy and physiology. Erin always does her best in class and gets on well with her classmates. We hope that her success will continue and that she will continue to enjoy the rest of the course. Nomination from Janet Brass, Darlington RGT – Claire started at Darlington Retired Greyhound Trust (RGT) as a volunteer before joining us as an employee working her way up to Head of Retired Section. Claire works to the best of her capabilities and is amazing within her role. Her strongest points are working with people…from the volunteers she supervises to the potential adopters who visit for information she makes everyone welcome and goes out of her way to help the adoption process. We have regular Duke of Edinburgh students and adults with special needs who Claire works closely with, very keen to spread the importance of animals as therapy. When not working at the kennels, Claire has driven hounds all over to their new homes, not put off by distance she has been as far as the Isle of Skye which required an overnight stay to ensure four hounds had the safety of a kennel. Claire has helped organise many fundraisers and embraced them all even though many include early mornings which are not her strong point! To begin with she had no knowledge of holding a fundraiser but can now confidently contact businesses as needed for preparation. Claire has gained her level 2 in Animal Care through our organisation with The College of Animal Welfare and is working confidently toward her level 3, her aim is to become a tutor/assessor in animal care and, in her words, “help the next generation of animal lovers find the same ambitions for animals I have”. Claire has recently completed a Tellington Touch course to help some of the ‘problem’ dogs that bounce in to us, this is one of her biggest passions and she can often be found walking out reactive dogs for training or sat next to a nervous hound in the kennel that daren’t get out of its bed. Claire is an all-round employee who will do anything asked of her and she does it with dedication. Nomination from Emma Chamber, Animal Care Assessor – Claire undertook her Level 2 Animal Care through the GBGB funding and enjoyed it so much she was desperate to do her Level 3. Claire completed her Level 2 and was missing college so much she would contact me and ask about different courses she could now do. At this time she was not fully employed at the kennels and was interested in completing her Functional Skills at Level 2 through the college, but could not afford the fees for these subjects. Claire has now been taken on by the Retired Greyhound Trust Kennels as a Level 3 apprentice, which means she can also do the Functional Skills alongside for free! Claire studied hard for her exams for Functional Skills and for some reason was quite nervous about doing them, however she passed them all with flying colours and got really good results! Claire’s work for her Level 3 portfolio is of a very high standard and it is always a pleasure to mark. 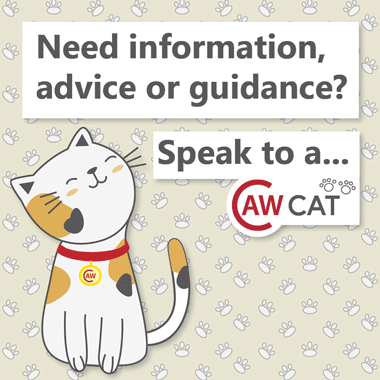 Claire’s main objective in her career is to eventually become an Animal Care Assessor. Claire works in her family Greyhound business, rehoming the retired Greyhounds – Claire also organises the funding and marketing of the kennels and works closely with the volunteers. Claire sets up fun walks and other events to raise money for the kennels. I feel that Claire deserves an award for her dedication to her course and the Greyhounds she cares for, if there was another work-based learning course after her Level 3 she would apply for it – she just wants to learn and expand her knowledge in all areas of animal care. Sian has been my apprentice since October last year. I own a very busy dog grooming salon and including myself there are three workers at my salon. Sian’s main role is to prepare the dogs for grooming, brushing out, bathing, drying and assisting in the daily duties. The team objectives are to provide a high standard of grooming, compassion and care to the dogs and to ensure a good customer service. I employed Sian with no previous work in the animal industry but she has shown excellent animal care and has a calm and confident way with the dogs. She is conscientious and helpful with all customers and has a good rapport with myself and my other member of staff. We all work very well together, she is a very happy and cheerful person all of the time which adds a lovely atmosphere to the salon. By working as my apprentice, Sian is learning to become a dog groomer, she is so keen and attentive to pick up my help and advice, always watching and listening intently when I am training during grooming. I am looking forward to her becoming a competent dog groomer as she is proving to be a very valued member of my team. I am very pleased that I chose to have an apprentice for my next member of staff. Sian is my first apprentice, this I originally found a little daunting as I have had to start training from the very beginning. I am glad I did take the plunge because Sian has proven to be an invaluable member of my team, always providing an excellent standard of work, having a good work ethic, extremely reliable and has a thirst for improving her work and learning. She never complains even when doing the not so nice jobs, like clearing up animal accidents, cleaning the cabinet dryer and dog hair caught within the wheels of a dryer. Sian is very helpful and accommodating, she is happy to do overtime and come in earlier if needed. She wants to be the best she can be, that is evident as she is already the best dog bather I have had working for me, and has picked up brushing to a high standard, finding and brushing out the smallest of knots. Well done to Sian! I can see she will make a very good dog groomer in the future and I hope she remains content to stay with me for the long haul! Shannon arrived as Apprentice for Kennel Assistant in March 2016 and we are delighted with the way she has developed over her time working with us. Shannon was quite shy at first, but was always keen to learn and quickly learned the skills and techniques required for working at Little Revel End. She has a can-do attitude and listens carefully to instruction and takes on new and varied tasks with enthusiasm. She works quickly but thoroughly when needed. We are so pleased with her approach and abilities, that we have offered her a full-time role here. Shannon has improved in all areas but most of all in her self-confidence overall. She is cheerful and hard-working and flexible and adaptable as needed. When she first started she was mostly working under supervision in the kennels and after a few months we encouraged her to have a more customer-facing role by having more training and skills so she was then equipped to help out in our shop/reception if the regular staff were off sick or on leave. So she has also learned about the importance of good customer service, face-to-face with customers as well as customer service over the telephone. Shannon has always had a caring way about her and this has also grown with looking after and caring well and up to our high standard for our client’s boarding and day-care dogs. Shannon has met all challenges and accomplished everything that is required of her with a pleasant personality. We are very pleased to nominate her for this award – she is a good example of a very successful apprentice. Tabby joined us around six months ago working as a Sales Administrator. She performs many duties including taking inbound calls, dealing with queries, taking customer orders, processing orders, liaising with the purchasing department to source products, and dispatch regarding special delivery requests and queries. She makes outbound calls via a scheduled call list prompting and taking customer orders. She manages office admin including filing, posting invoices and franking. Tabby wishes to use her apprenticeship to gain further skills and understanding of business administration. She hopes to become an experienced and skilled administrator in the future. Tabby’s confidence has grown dramatically since starting her apprenticeship. Her communication skills have improved vastly, she is able to communicate both written and verbally clearly and confidently – a must in her customer focused role. Tabby’s organisational skills have developed during her time at Newline Anglia. She is effectively able to manage multiple tasks and prioritise correctly. She provides the highest level of customer service at all times, going the extra miles to ensure customer receive the best possible service at all times. Tabby has very quickly become a valuable member of our sales/customer service team. Although Tabby is currently undertaking an apprenticeship, we regard her as skilled as our existing team of experienced administrators. She has put a great deal of effort into her studies, completing tasks set in a timely manner and to the highest standard. She has taken great pride in her apprenticeship, and sure she will continue to do so, and in turn take from it valuable knowledge and skills.